BlackBerry OS 10 is finally officially ready for launch - Research in Motion will officially unveil the operating system on January 30th, 2013, and the first two devices running on it will become available in the month that follows. But RIM is already organizing events for developers, and at one of them, we get to see a very detailed 10-minute tour of BlackBerry 10 on a Dev Alpha B device. The version of the platform may not be the final one, but it definitely looks very close to final. The whole demo is conducted by RIM Regional Senior Product Manager Claudio Roselli, so it’s as official as it gets. Best of all, you get to see some of the signature features of the OS in detail - the adaptive lockscreen, the BlackBerry Hub and the predictive keyboard among others. Someone must have realized that BB10 is not yet official, though, and pulled the video shortly after. Luckily, nothing is lost on the internet, so you can check out the reposted video right below. I did too but it seemed as though at one moment he would swipe in the home screen, and then with the same gesture, a completely different app would swipe in haha. I'd say it is pretty good OS which is well organised, smooth, present true multitasking and customization. Just a quick advise :- Please study that "Swipe" feature carefully and introduce in BB 10 with ease of understanding (so people don't get confuse especially non technical). 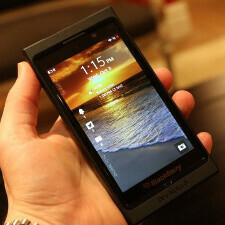 Otherwise BB 10 has got potential and would definitely attract crowd of enterprises, youth and geeks. Oh, where were you for the past year? In case you lived under a rock, I'd like to tell that Jolla is continuing MeeGo instead of Nokia. Even if you were living over the hill, Will you buy that Jolla MeeGo?? I doubt.. If it comes where I live, then why wouldn't I? Provided it has decent specs and essential (in my view) apps. Too late. There is nothing super innovative - people won't switch to blackberry from android or iOS. iOS + Android = Brand new BlackBerry 10. However, it seems it is much more organize. I could have watched the whole video, but the music in it is too loud, annoying, and distracting.besides, i'm only fluent in english, so i'll wait a day or two until i can get a real handle on whats going on before I pass judgement on bb10. Hmmm, looks like it's going to fail. The apps are what's important and I can guarantee you that no developer is going to go out there and support this system. It looks like garbage. RIM's last chance in the smartphone market. This looks like a very legit OS, and very similar to MeeGo in the N9... although i do see myself getting this mobile cos it's great for organized people out there, and i own an N9 and an S III so i've got experience with android and meego.. There probably won't be too many people who will switch especially the yanks cos they're too hooked on their iSheeps... this could be like a dead-end device such as the N9 which is so sad to say cos the MeeGo and BB10 are great.. These are just some notes from my perspective as I watched the video. The lock screen looks android, the lock screen transition looks similar to the LG Optimus G (except the LG was a bubble), the home screen looks like iOS (apps in consistent rows), Windows (updating tile-like apps on home screen), & Android (widget-like tiles/apps, multiple home screens with the dots below to indicate which home screen you're on resembles android, as well as having the on-screen buttons at the bottom, and the card stacking animation when switching between home screens) combined, the user interface design sort of reminds me of ice cream sandwich/jelly bean with the simplistic black/white/bluish color (like on the menu and app store), the navigation bar design above the text messaging screen resembles iOS, and so far the demo version is pretty sluggish when it comes to responsiveness, BUT I am nevertheless very excited to see Blackberry 10 making a comeback. The unique user interface, keyboard, alarm clock lock screen, and the messaging convenience with bbflow technology are just a few things I'm really looking forward to. Hopefully an awesome premium design to follow through with it. I keep seeing the N9 in this phone. The UI, the design, etc. That clock is a direct copy. We live in an english country, where is the English version? Many design parts are copy of what we could see in N9 and in Symbian Belle. BB nowadays impresses me with this update!! I must admit, this looks like an impressive, if not too busy OS. I'm looking forward to learning more about Blackberry 10. But for now, Android is by far my favorite. BB should just use a skinned version of android with some preinstalled productivity apps or maybe even their own app market like Amazon. no need for that! if you want android apps to run on BlackBerry 10/PlayBook it can!! all you need to do is convert apk of android to bar! use google to know how! or youtube tutorial!